I’m on Pinterest. There, I admit it. In a male dominated industry to be a guy using Pinterest warrants a lot of jokes from co-workers and colleagues. A recent survey indicated that of the 12,000,000 US users currently on Pinterest only 17% are men which justifies the onslaught. However, given the fact that an overwhelming percentage of the retail buying decisions in our industry are made by women it seemed like it might be a worthwhile gamble to turn in my man card and start pinning. So I did. I currently have 12 boards and 125 pins and very little idea about what I’m doing. 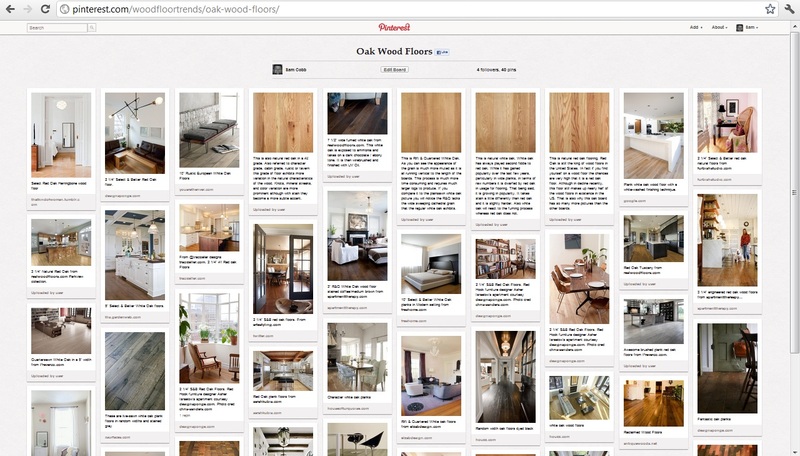 Here is my main Pinterest page showing 12 boards I've started on different types of wood floors. As to what I’m aiming to accomplish at this point I can’t say I’ve nailed that down. A few ideas that have come to mind have been to start a virtual show room for wood floors that focuses not on individual 18″ x 18″ samples as you see in a retail flooring setting but rather on actual room scenes. Picking out a floor that you’ve seen in images of various furnished settings should be a great help more than just having essentially a swatch to go by. So, I started by re-pinning a lot of images already uploaded to Pinterest that have wood floors, identifying each one by species and grade and any other pertinent details. Secondly I try to pin any interior scenes from today’s top interior design bloggers also identifying the wood floors in detail and lastly I’ve uploaded some of my own images from our own product lines being careful not to make the entire board an advertisement for my company and the products we make. Here is a view from the Oak board containing pictures of different types of floors both red oak and white oak and all different widths, grades, stain colors and finishes. A second thought I’ve had is to make myself available to interior designers and homeowners alike to help identify floors from images they might want to use in future projects. I daily peruse my Google Reader feed to find the latest interior images from the most prominent design bloggers that contain wood flooring. I identify the wood floors, pin them and then try to comment on the host blog with a tip or interesting anecdote about the floors. Make no mistake, I do this for dual purposes. First off, I do care deeply about our industry and would be glad to liaise between the manufacturing side of the industry and the interior design community to foster greater understanding and cooperation. But I won’t hide the fact I also hope to set myself up as a resource for designers and specifiers as well in the hopes that I might land a job or two in the process. 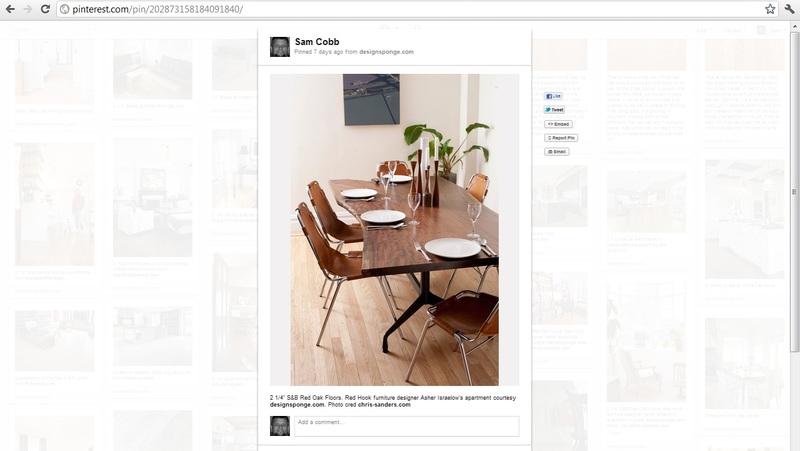 Here is a screen shot of an actual pinned wood floor image. In terms of organization I’ve started by organizing boards by species and styles. For example I have a hickory board that has an image of raw hickory flooring in two grades and shares a bit about the characteristics of that wood. Then I’m filling the board with pictures of finished hickory floors from different manufacturers so people perusing the board get a full gallery of that type of floor to study. I’m interested to find out how trends will migrate with this new pictorial feed. One thing I’ve noticed a lot as I search Pinterest for “wood floors” is that there are a very high percentage of herringbone floors. While herringbone floors have always held a market share in the US it is fairly limited. However the number of pictures on Pinterest of herringbone floors seems to be a very high percentage of the wood floor shots. My first thought is to think that is a European influence on the boards where those floors are much more utilized but it’s hard to say. If the popularity of herringbone floor images being pinned and re-pinned is any indication of coming trends then it would behoove some US manufacturers to get back in the business of cranking out a lot of herringbone to meet a coming demand. 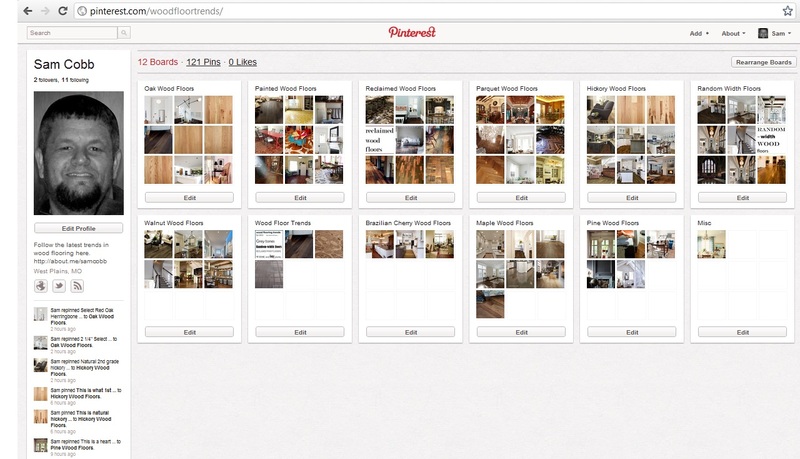 I’d also like to hear from others in the wood flooring industry that are using Pinterest and what their experience with it has been, feel free to drop some comments here. Also if you have pictures of finished floors whether you are a manufacturer or a contractor please feel free to send them to me and I’ll get them pinned on the boards and get your name on them. This a a wonderful initiative. Keep up the great work! Thanks Etienne, I have a couple of your shots uploaded, I’d have to understand a little more about the new wave product so I’d know how to organize those. What species are those and how does that process work? Thanks for chiming in! I have recently started pinning hardwood flooring images from our collections at Mullican Flooring, and we have recently added an engineered line so that we can bring jobs back to American soil. We are focusing on flooring made in America, so please feel free to repin any of the images from mullicanflooring.com. Great to hear Amber. Are you making sawn, rotary or sliced products here or a combination of both? I’ll check out your boards and re-pin some images this morning. Ive been thinking about learning what the Pinterest is all about to, but have not got around to figuring it out yet. Feel free to use photos from our collection of photos too. http://www.hickmanwoods.com Thanks for the writing the blog, I enjoy reading it. Thanks for following along Jess. I’ll try to go through your site this afternoon and pin some images. How are things in West PA? Gotta say you have peaked my Pintrest? Ha, really Im about to trade my card in and set up an account myself. The #1 complaint about wood floor samples in the showroom is size. End users like visuals/room scenes to help with their decisions no doubt. I run into quite a few people who have a tough time visualizing the floor from a 18 x 18 sample. Thanks for commenting Kevin. If you do start pinning please let me know and I’ll re-pin your images. I also think that for un-finished flooring in particular it would be great to have a room scene shot of a certain grade from 3-4 different mills to show how #1 differ’s from mill to mill. Good luck with it. Let me know how it goes. The idea of doing a board illustrating grades on big room scenes pictures is very interesting and worth some thoughts. I think if we can get some larger mills interested in sending in grade shots of natural floors, really needs to be natural of course to see it, then that would be great. I’m sure a lot of mills probably have this photography already if we can just figure out how to get it on the boards. I like your post. It sounds like you are doing everything right! You can also upload images of your product on HomePortfolio.com for free for some additional web presence. We have a “Pin it” button under each product listing on the site for user’s to pin your products to their boards. Let me know if you want me to set up a login for you. Love to hear more about it Kerry. Setup a login for me please. We are setting that up to you and sending you a welcome kit! I will send you a direct email as well.